It’s a question that hits home for many people of color—especially at a time when mindfulness in the popular culture, as well as in the therapy field, is widely seen as a panacea for whatever ails us, no matter who “us” may be. But for some, Kabat-Zinn’s answer—that it has the potential to bring attention to “the ills of society”—sounded vague and offered little practice direction. More recently, Angela Rose Black, an assistant professor at the University of Illinois at Urbana-Champaign, is taking action at a grassroots level. In 2016, she founded Mindfulness for the People, an organization that pledges—in the words of its website—to “radically reimagine the mindfulness movement” by introducing culturally conscious mindfulness techniques to college students through on-campus trainings and consultations that address “racial battle fatigue among people of color” and “white fragility” among white people. A shirt that Black sometimes wears to meditation conferences invokes Davis’s question: In a racially unjust world, what good is mindfulness? Black’s critique of mindfulness mirrors the questions that some mindfulness-focused clinicians are asking themselves on the heels of the Black Lives Matter movement: do current mainstream practices allow people of color to explore their unique experiences and work through racial trauma? And if practices have room to become more racially informed, what might that look like? Or could the mindfulness movement be so steeped in white privilege that it needs a complete teardown, as Black contends? Sawyer remembers working with a young black man who’d come to therapy after facing racial discrimination at a job interview. For several sessions, Sawyer allowed the young man to voice his anger, and together they talked about the legacy of slavery, implicit bias, and what it’s like growing up black in America. Throughout, Sawyer noted his client spoke often about his African ancestors, whom he traced back to Ghana. These ancestors, the young man said, were on his mind almost every night as he lay awake in bed, remembering the microaggressions he’d faced during the day. “What would it be like to sit in the powerful presence of your ancestors and focus calmly on your breathing?” Sawyer asked him one day. In their next session, the young man reported that when he did this each night, his whole world seemed to slow down. It was almost as if the ancestors were inhabiting his body, he told Sawyer, imbuing him with strength and comfort. “Any therapist would tell you he was in a meditative, self-regulatory state,” Sawyer says. “How did I help him get there? I listened to his worldview and withheld judgment, rather than telling him how to meditate and what the studies say about it. So we were able to use meditation to work through his suffering.” Of course, it’s standard practice to try to meet clients where they are, but Sawyer adds that mindfulness teachers often don’t consider what’s unique about the experience of being a person of color in America. Sabrina N’Diaye, a therapist working at the Center for Mind-Body Medicine in Washington, DC, explains why a technique like the one Sawyer used with his client is so powerful. Calling upon the strength of those who came before you, she says, especially hits home for the black community. “The ability to tap into somebody who’s been there before and has transcended whatever aspect of life you’re struggling with now has special relevance for us,” she says. N’Diaye says she sees a “beautiful shift” happening in the way white and nonwhite practitioners alike are tackling the experiences of people of color through mindfulness work. In fact, she says, she’s excited about the conflicts and challenges ahead. Activists like Black are doing valuable work, she says, creating opportunities to have real, loving conversations about what oppression looks like, and the new ways therapists can bring about healing. Already, there are signs that mindfulness practice is being rethought on an institutional level, with people of color and their experiences in mind. In October 2016, the journal Mindfulness reported on a NIH-funded clinical study of 12 black women, which included Angela Rose Black as one of its three primary researchers. 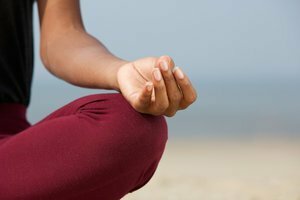 The study concluded that mindfulness meditation had the potential to reduce the effects of race-related stress on women’s psychological and physiological health. Across colleges and universities, too, professors are exploring how mindfulness practices can be applied in the fight against racial bias. Recently, University of Kentucky psychologist Candice Nicole created a 17-minute guided meditation recording titled Black Lives Matter Meditation for Healing Racial Trauma. The recording features positive affirmations designed to counter the feelings of unworthiness Nicole found among her clients of color. Since its debut, it’s been used at colleges like UCLA, Emory University, the University of North Carolina at Charlotte, and the University of Iowa. The hope—and prevailing optimism—is that these teachings will become part of the training of a new generation of racially conscious mindfulness practitioners. This blog is excerpted from "Making Mindfulness More Racially Sensitive," by Chris Lyford. The full version is available in the March/April 2018 issue, A Gift of Time? Facing the Challenges and New Possibilities of Aging. Read more FREE articles like this on Cultural, Social, and Racial Issues.